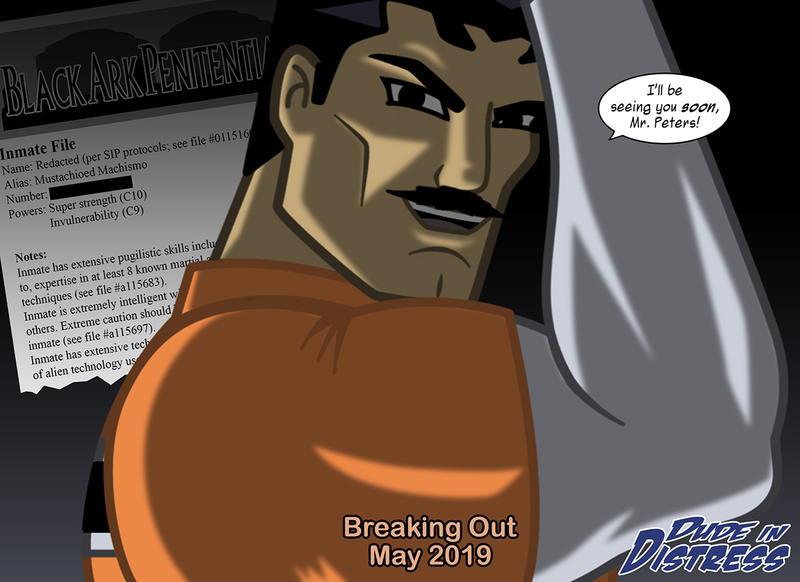 Here's the second teaser for Episode 3: Malicious Machinations of a Mustachioed Menace, and we get our first look at the titular mustachioed menace (in his Black Ark prison garb)! What does he have in store for Clark, and what are his ties to Femme Fantastic? This and much more will be revealed in the next episode of Dude in Distress! In the next few weeks, I'll likely have another image and a final teaser once I decide on the exact start date of Episode 3. Not sure which of these two updates will post first. Then it's on to Episode 3! He looks like he should be dressed like one of those old timely villains that would tie people to railroad tracks in the old silent films and old cartoons. So Clark, a super strong, super durable villain, who learned martial arts to further magnify the effectiveness of his powers, is intelligent, and has alien tech now seems to want you dead... good luck. On another note how do the power classifications work? Where does C10 strength fall on a scale of 'just a little over human norm' and 'can he wrestle the hulk and win'? C1 is a human basline. C10 is the top of the scale. There could be entities that break the scale (e.g., C10+), but C10 is pretty much the max. According to this assessment, Mustachioed Machismo could be on nearly equal footing with Con'qorians as far as strength and durability go (although I don't think Femme or Admirial Awesome have allowed a full measurement of their power).